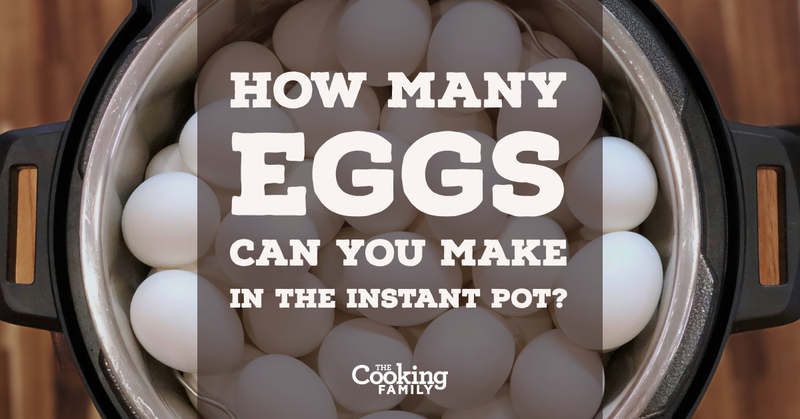 You are here: Home / Instant Pot / How Many Eggs Can You Make in the Instant Pot? 78 Large Eggs. That’s right, six and a half dozen! How did we do it? We just followed our standard recipe for Perfect Hard Boiled Eggs in the Instant Pot! If you need a refresher, follow that link and see how we do it. This is the coolest part: Your big batch of eggs will take the same amount of time to cook as if you were doing just a few eggs! 1. Your Instant Pot will take considerably longer to come to pressure. When I cook small batches of eggs, it’ll be at pressure in a few minutes. When I put this many eggs in my 8 qt model, it took around 30 minutes. 2. You can safely fill your Instant Pot beyond the Pressure Cook Max line. You would normally never do this. If you’re cooking a soup or stew or anything with lots of liquid, your Instant Pot will never come to pressure. It’s just not a good idea. But due to the shape of eggs, there’s lots of air between each one, so you can safely stack as many as can fit, and you won’t have any problems. 3. When you do this many, there may be a few cracked eggs. It’s just the law of averages. Some eggs will have compromised shells and will crack. Also, you may have some variance in your yolks. All of mine were cooked well, but a couple of them were overdone with a slight grey ring around the yolk. But if you need a lot of eggs for something, it’s worth the tradeoff in my opinion. So, next time you need a lot of eggs cooked at one time, go ahead and fill your pot with as many as you like! Have you tried this already? Let us know how many you’ve done at one time! Thank you for trying this for me so I don’t have to. Looking forward to bringing a TON of deviled eggs for the 4th. They are so easy to peal when cooked this way. Now I just have to figure out how to transport that many filled eggs. Do you pour the ice water over the eggs into the Instant Pot when the eggs are done cooking? Thanks for the question! Yes, we bring the stainless steel insert right over to the sink and begin flushing with cold water immediately. Then we pour off the first bit of hot water as soon as it’s high enough to not pour out the eggs. 😉 Then we add more cold water and ice. Lastly, we peel and enjoy! 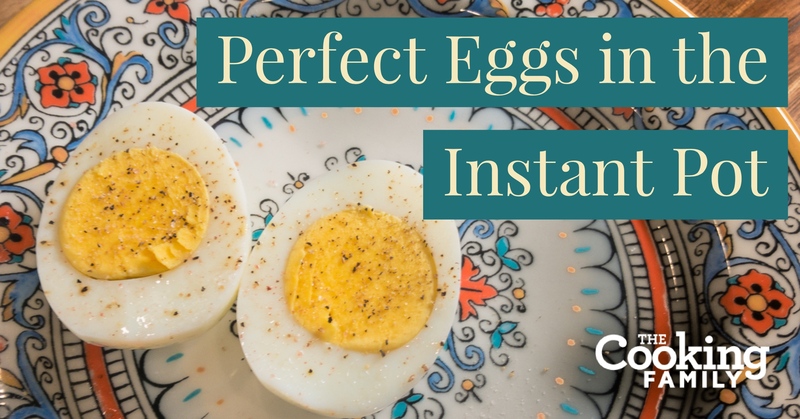 Thanks so much for this guidance using the Instant Pot for hard boiled eggs! I’ve been using a smaller regular pressure cooker for a few years after a friend told me about this miraculous trick. The fact that the shells literally peel themselves once cooked is a mind-blowing delight. 🙂 I’ve wanted to make BIG batches all at one time but didn’t know how, or what would happen. My family asks for deviled eggs for every gathering, and they eat a LOT. It used to take hours for me to tackle this project. I just made 4 trays and it took less than an hour. Woohoo! Now on to the cookies. Happy Thanksgiving! Hi Cami, I’m so happy to hear that this was helpful! I hope you had a great Thanksgiving feast! We had a lovely Thanksgiving, thanks. Hope you did too. Now on to more holiday festivities and a bunch more deviled eggs. LOL! Eggsactly! Hadda write that. Teehee. Aren’t we lucky to have our IP’s and this fabulous and quick way to cook the eggs? WOW what a life saver! Cheers and happy holidays to you and everybody. “same time” to cook a “small batch of eggs”? The pressure mounts the same no matter, so i will stick to the 5 minute hardboiled egg? Hi James, sorry for the confusion. Yes, when I said “same time,” I was referring to the Instant Pot settings. 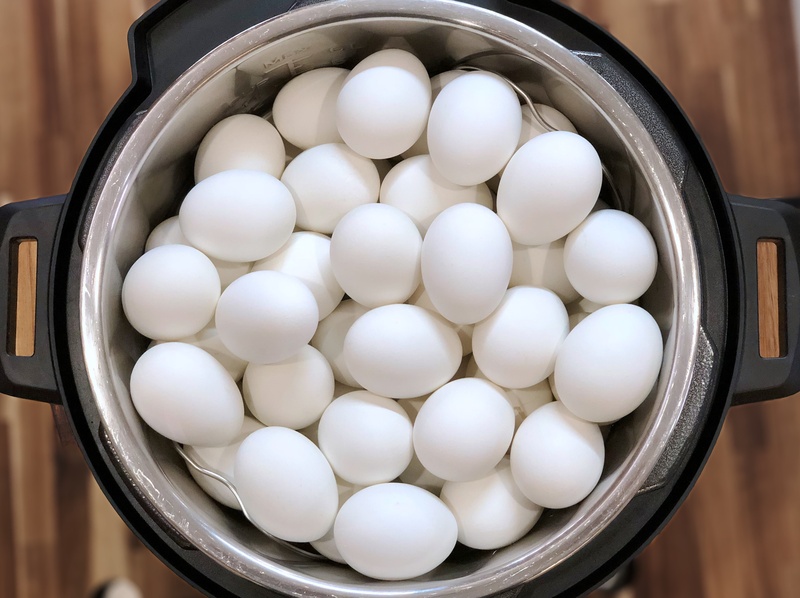 However, the total time commitment will be longer because it will take longer for your Instant Pot to reach pressure with a full pot of cold eggs. Once it reaches pressure, it will take 5 minutes to cook just like normal (or whatever your preferred cook time is.) Hope that helps. Seconding the “thank you for doing this so I don’t have to” comment. I was waffling on the purchase of an IP because I really do think NEED another kitchen appliance. Then my friend sent me a link to a hard boiled eggs recipe in the IP and I was sold. Great post, thanks for the info! Quick question tho – I noticed you mentioned Low pressure while other blogs reco High pressure for eggs with the same 5 min cooking time. Wondering what the difference is or if pressure won’t matter – clearly you’ve had success with your method! Thanks! Good question, Christina. Since eggs are so delicate, I prefer them on low. I find that they’re less likely to crack if the shell has imperfections. In my experience, they also are less likely to be overdone. Others may have different preferences on how they like their eggs, so try it both ways and see what you like. Thanks for reading! With Easter just around the corner, this is a lifesaver!!!! Thank you so much for sharing! So happy to help! Have a wonderful Easter! When I attempted This the white of eggs turned out a yellowish color. They tasted normal but weren’t very appetizing for deviled eggs lol. Can you tell me why that may have happened? My first try (of “just” 36…my family is big but not THAT big) were yellow too and smelled a bit funny. Tasted fine, but you’re right – not appetizing for devilled eggs. I made a mountain of egg salad and all was well. I cooked on high (because I didn’t know how to turn mine down!) and think I ended up overcooking them. I now do high for 3 minutes, quick release, and ice bath for up to 36 at a timeand it works like a charm. Thank you so much for this post. I live in Italy with my Italian husband. Colored Easter eggs are not a tradition here, but I made a dozen for the family Easter gathering a couple years ago anyway. There were a hit. Now everybody looks forward to Zia Amy bringing the eggs on Easter. I must make many more! I also just got an IP for Christmas so I am still learning, but posts like these are super helpful.